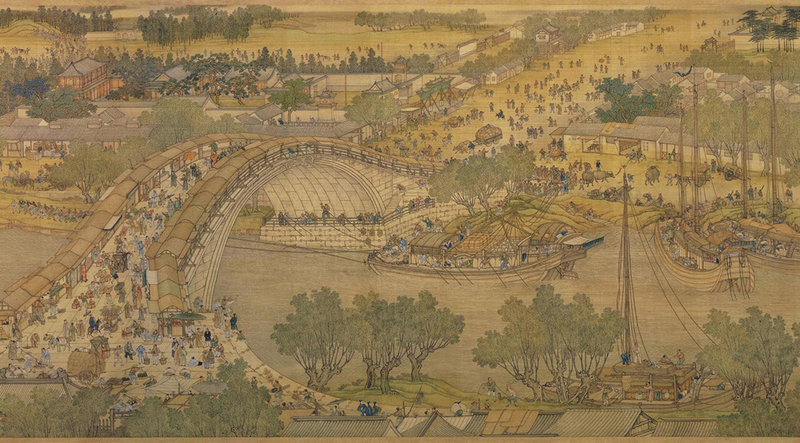 Section of Along the River During Qingming Festival, five court painters under the Qianlong Emperor, After Zhang Zheduan, 12th Century. Columbia University Press, pp. 296 198-204. Yang Mu’s verse autobiographical prose, like his verse, relies on close observation of Taiwan’s landscape, flora, and fauna for imagery and metaphor. Yet if the humidity, the light, the tang in the breeze—the embodied experiences of the young Yang Mu—are distinctly Taiwanese, his themes are broadly human. Each anecdote is fixed to lovingly-recalled local particulars, and so it is indeed a Taiwanese literature we read, even in translation. Yet my immersion in the strongest passages of Memories of Mount Qilai is as deep as the immersion I feel reading Pepys’ diaries, or Kafka’s journals, or certain essays of Montaigne. If the Eurocentric web of connections I make to his memoir betrays my inability to respond to powers in Yang Mu’s work which are distinctly not Western, it is also evidence, I believe, that there is nothing provincial (in any pejorative sense) about Yang Mu’s achievement. I hope it does not diminish my respect for a nascent Taiwanese literature to celebrate connections Yang Mu makes to Western authors and texts—he took a PhD at Berkeley, has translated poems by W.B. Yeats into Chinese, and was a fellow at the International Writing Program at the University of Iowa. And when I say that I love his revision of Wordsworth’s “stolen boat” episode from The Prelude, for example, I don’t think that’s merely because I recognize the parallel. I heard that familiar music drifting from off in the distance. …He said, “Okay.” He then bent down behind me again, and I wondered what he was up to. The moment I turned to look behind me, I felt the boat move forward and saw him pushing forcefully with his right hand and, pleased, he shouted happily, “So long….” The small boat left the dock at the stone steps and smoothly and calmly shot toward the heart of the river. The river flowed down from the majestic heights and boundless green mountains, but not necessarily from the depths of the mountain chain. I once followed it upstream back to its source; later, one hot summer morning I rode my bike along its banks and reached the source before noon. What amazed me the most at the time was how the source could be so narrow but the shallow flowing water so clear. Rocks, small and large, were scattered all about. It was as if the spirits of the mountain and the ghosts of the river, along with the mischievous tree and flower spirits, had contended to arrange them in a dream-like display. On both sides of the small, narrow trickle, shrubs and vines grew thickly, with bright clusters of white flowers—the name of which I never determined—blossoming amid the dense leaves. The riverbed resembled a dish of pearls inserted between two banks of jade. The spring water descended, flowing clear and shallow as usual, but the riverbed suddenly widened, inundated only by the torrents caused by the typhoons. Usually it flowed at a trickle in a calm and tranquil fashion without attracting attention. The flow of water increased as the river neared Mount Milun, flowing clear and deep around its small southern foot, ever so quietly, bathing the unbroken reeds, wild celery, violets, and ginger. Huge flame trees on the bank cast reflections of their leaves and flowers on the surface of the water, sometimes even dropping leaves and flowers to gently float on the leisurely rising and falling waves, bobbing slowly away. The slope of the bank behind the trees was covered with wildflowers. Beyond the bank was an old residential street of Hualien. I never believed that that clear, shallow, dreamlike display that originated in a dish of pearls and flowed between two banks of jade could really instill fear with the sound of flowing water from behind a long bank built behind the flame trees. I could hear that unbroken song drifting toward me. Was it the music of the river? Or was it the creation stirred deep within my heart, surging and swelling, gentle and gloomy, omnipresent? It also sounded like an echo fading off into nothingness…. My little boat hesitated for a moment, unsure of which direction to proceed. Downstream, the river became extraordinarily wide and the opposite bank rose abruptly like a cliff and, for a distance of several hundred meters from east to west, the flowing water unexpectedly paused in an ancient, thickly forested lake, placid and quiet, surreptitiously whispering that repeated and familiar tune. In the old days, this stretch of river was called Army Bay. …I rowed with both oars, heading down stream. I knew the ocean was not too far away and was a little scared, though perhaps even happier still. At that moment, my small boat had passed the watercourse under the large bridge between the two bridge piers and, like a water strider unconsciously pausing in the swiftly moving current, was lifted and sent on by the water, as if accompanied by song, soft as an angel’s exhortation, utterly calm; the wake blossomed like a bouquet of spring flowers, withering at once, drifting away, but then never slacking or dispersing. But the sound I heard, beyond being entangled in my own questioning, was the sound of bicycles braking high on the slope above the north end of the bridge, the sound of bicycle chains. It knew it was the sound of school being let out. They must have lowered the flag, listened to the speech of exhortation, dispersed, and set off for home. Nine hundred male students were surging out, swinging identical book bags in the same color and with the same weight, their hats on their heads, or in their hands, or, like mine, thrust in their book bags. I didn’t attend the flag-lowering ceremony today. Starting around noon, I couldn’t sit still as a strange, unformed melody floated through my mind, as if from the other side of a high, dark ancient wall someone abandoned themselves to chanting for me a fragmented but still special and recognizable song of prudence, pronouncing words that were difficult to understand but occasionally stressing a certain expression, seemingly also what I frequently heard between sleep and wakefulness. I looked around me: the distant sky, sea, prostrate mountains, the aged banyan tree, hibiscus, canna lilies, and the beehive under the eaves, steadily growing larger by the day. “How am I to let go, be free, release myself, and be different from others?” I repeatedly asked myself such silly questions and then when totally exhausted, ‘How can I prove I am different from others?” The blackboard was covered with proper nouns: “Age of Enlightenment,” “feudal lord,” “serf,” “guild,” “Galileo,” “isolationism,” and “indulgence.” I descended the steps of the path by the swimming pool and walked along the stone wall beside the playing field, my book bag slung over my left shoulder, my hat in my book bag, careful not to stumble in the ditch, past the flagpole, walking lightly across the slope newly planted with flame trees to the bicycle shed, quietly unlocking my bike and pushing it out, holding it with both hands, through the small gate and, by the time I was noticed by Old Jin, who was patching a tire, I had rode off swiftly and was gone…. The torrent was about to cover me, turn over my pitiful little boat and me with a gigantic and vigorous force, sinking us. No one would know I had been submerged in this way and died. The skinny guy would certainly not open his mouth about renting me a boat. Someone showed up during school hours with a book bag to row a boat, perturbed in appearance, abiding without moving by the bridge pier after the sun had disappeared behind the mountains. He knew better than to mention it. Ask Old Jin? Old Jin would say that he might have heard a student at the bicycle shed before flag lowering, but he was patching Teacher Xu’s tire and cleaning his bike, and didn’t have a chance to see who it was. But then again, perhaps no one would even think of asking Old Jin. I sank and rolled along the bottom and was swept down the river to the sea. The small boat ran aground on the beach, upside down. Perhaps that was a very good ending. Perhaps ending is not the right word—perhaps it was a beginning. I was carried far away by the flood into the indefinite distance, the cool dark vastness. That boundless mystery and surging space, so lush and vast, all belong to me alone…. In 1998, Daniel Bosch was awarded the first Boston Review Poetry Prize for four poems riffing on films starring Tom Hanks. His work has been published in journals such as Poetry, Slate, The TLS, Agni, Berfrois, The New Republic, The Huffington Post, The Fortnightly Review, and The Paris Review, and a collection of his poems, Crucible, was published by Other Press in 2002. His set of triolets called Octaves is downloadable for free at beardofbees.com. Daniel has taught writing at Boston University, Harvard University, Tufts University, Merrimack College, Walnut Hill School for the Arts and Emory University. About Memories of Mount Qilai. The camera sees what a 17 year-old boy sees when he stands where a path meets a paved road at the edge of a dirt farm.